A small but enthusiastic audience turned out in the Lodge on Monday to hear Sgt. 1st Class Dana Bowman tell how determination and drive overcame injury and adversity in his life. A member of U.S. Army Special Forces and the Golden Knights, the Army’s elite parachute team, Bowman lost both legs in a training accident and now tours the nation stressing ability over disability. 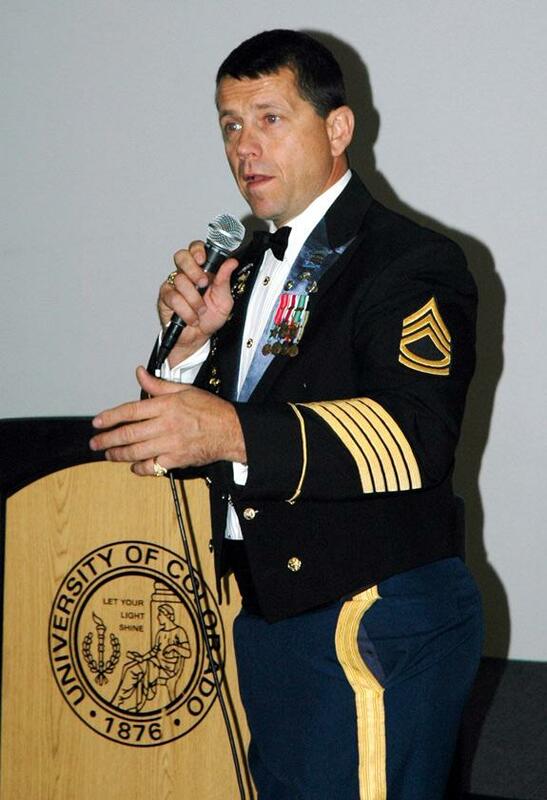 His visit to UCCS was part of campus Veterans Day festivities. 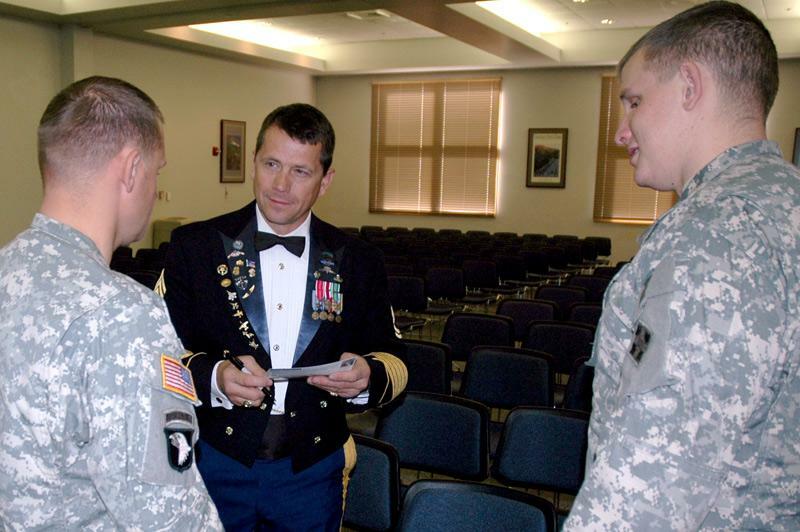 As the first double amputee to re-enlist in the Army, Bowman recounted his accident and his journey back to being an active, contributing member of society. He joked about how his pilot’s license states he “must wear artificial limbs when flying,” and mentioned plans to set a high altitude record in an upcoming parachute jump. After visiting UCCS, Bowman delivered the American flag to Invesco Field in a dramatic parachute jump preceding the Denver Broncos game. Praising teamwork and education along with will to succeed, he presented a commemorative coin to Dana Rocha, director, UCCS Military and Veteran Affairs. Retired U.S. Army 1st Sgt. Dana Bowman signs autographs for two soldiers who attended his presentation Monday at the Lodge. Retired U.S. Army 1st Sgt. 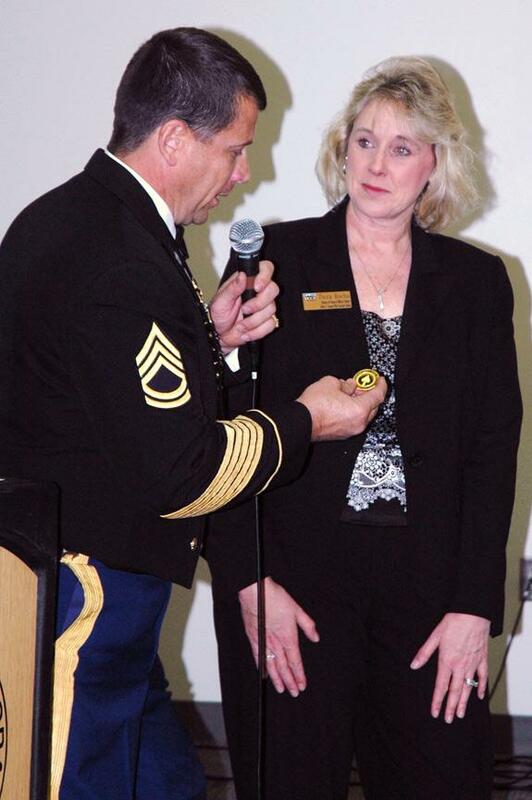 Dana Bowman presents a military coin to Dana Rocha, director, Office of Veteran and Military Affairs at the conclusion of a Monday presentation at the Lodge. Retired U.S. Army 1st Sgt. Dana Bowman makes a point during a half hour address Monday at the Lodge, part of Veterans Day celebrations on campus.